Turtles are, to most people, small inoffensive little critters that don't arouse feelings of fear, disgust, or hate (like snakes). To many, they just sort of exist; going about their daily business with little or no attention being paid to them or what they are doing. In some ways, that's great. Because they don't conjure up feelings of dread for humans, most people don't outright kill turtles when they are encountered (which is often the fate of snakes). So, in that respect, turtles are lucky to be such unnoticeable animals. However, there's a down side to this anonymity. Namely, people could care less about them. So little do we humans care about turtles, in fact, that we can't even bother to slow down a little while driving so that we don't accidentally squash the poor little critters as they try to cross the road. Why are they crossing the road in the first place, you ask? Good question. What is that turtle doing in my backyard? 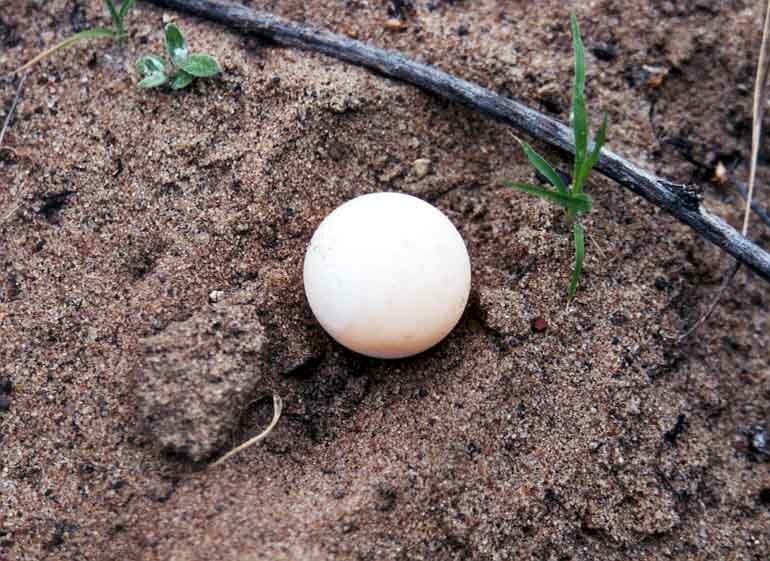 Female turtles who are pregnant and ready to lay their eggs will travel great distances to build nests. This is why they bravely attempt to traverse busy interstates and highways. They have an instinctual force driving them to migrate away from the safety of the water to lay their eggs. So, how does this affect you? Basically, sometimes a female turtle will get "lost" and end up in your back yard (especially if you live near a water source). She's there to lay her eggs and, if you leave her alone, she will probably be on her way in several hours. 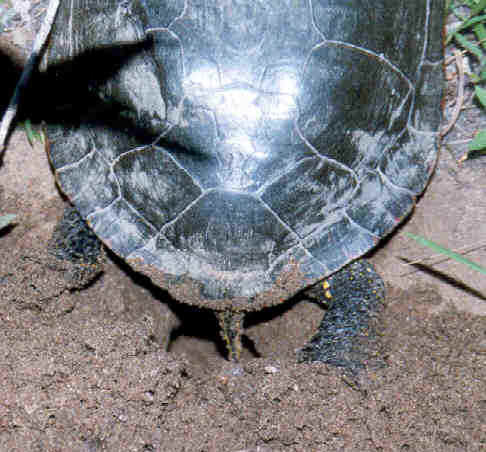 They are not dangerous (with the rare exception being the common snapping turtle or spiny softshell) and they will not do extensive damage to your lawn. 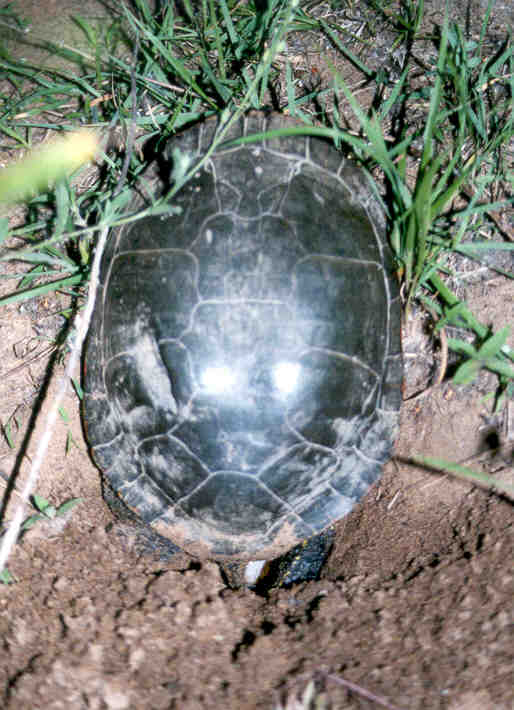 Pictured above: A female Painted Turtle building a nest (top). First she digs the nest with her hind feet (bottom left) and then she deposits the eggs (Bottom right). How can I keep turtles out? There is really no need to do this. 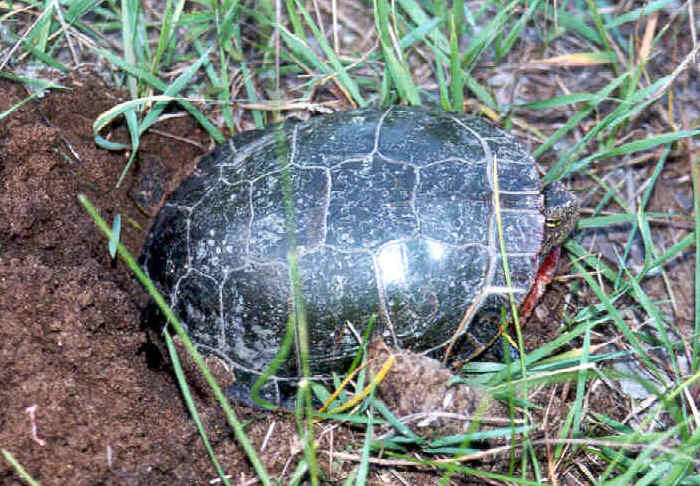 Turtles will probably only appear in your yard to lay eggs during June and July and they cause few problems. If you absolutely must keep them out, the only thing to do would be to build a fence around your property. Remember, however, that turtles can dig and may be able to get under a fence that does not have its bottom portion buried. If you absolutely have to remove a turtle from your yard, or are worried about accidentally hitting it while mowing, gently pick it up and place it either in the nearest pond or river or under some bushes. 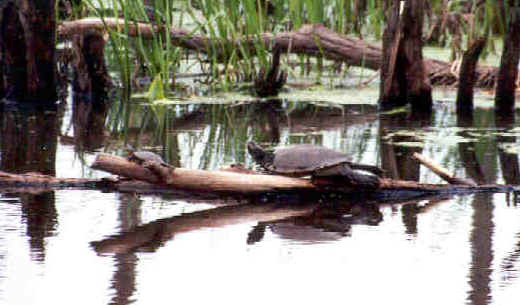 If the turtle is a snapping turtle or spiny softshell, it is best to leave it alone and let it go on about its business. Above: a nest raided by raccoons, yet with many eggs untouched. I had scared off the perpetrator before he was able to finish the job. 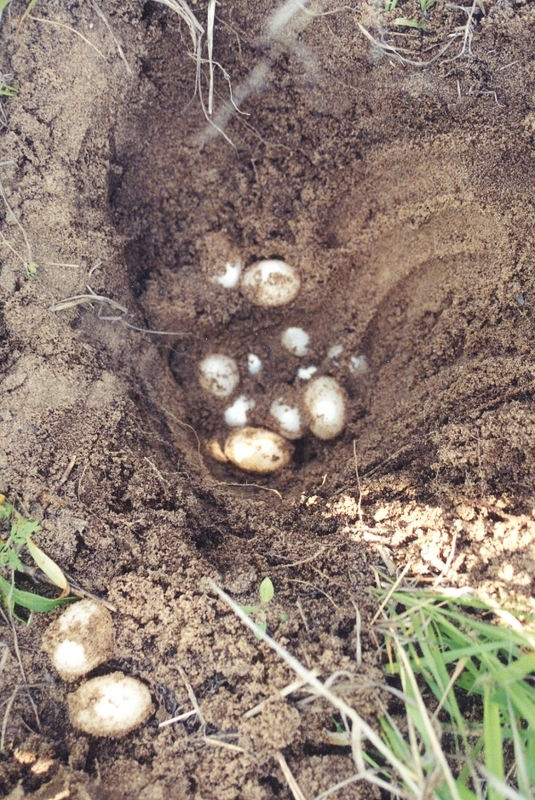 These eggs are elliptical, and likely from a map turtle. The egg pictured one above this is spherical, and probably from a snapping turtle or spiny softshell.